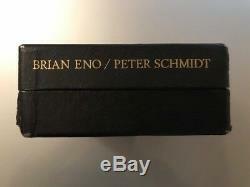 Brian Eno and Peter Schmidt. 1st EDITION 1975 limited to 500 copies! Hand signed by the authors. 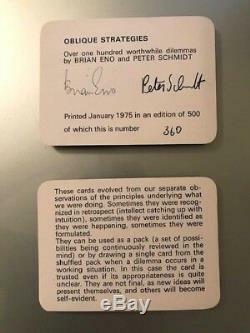 This is card set #360. 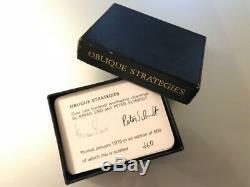 This is the very first edition of the famous OBLIQUE STRATEGIES by Brian Eno and Peter Schmidt. This 1975 edition was limited to 500 numbered copies, hand signed by the authors. Most of these sets were given away to friends and fellow musicians. David Bowie's very own copy he used when in recording studios was part of the recent exhibition seen around the world. 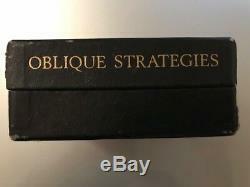 The Oblique strategies are known by musicians and still used today as well as for daily inspiration. Several re-editions of this card set were made since but very few people have ever seen this first edition. This is an exceptional collector's piece. Impossible to find in this great condition. Cards are super clean, box is good, signed card is perfect. All reasonable offers will be considered. 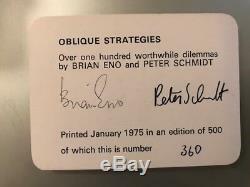 The item "OBLIQUE STRATEGIES Brian Eno / Peter Schmidt 1st EDITION 1975 numbered/signed" is in sale since Sunday, October 28, 2018. This item is in the category "Musique, CD, vinyles\Autres". The seller is "leicax70" and is located in Paris. This item can be shipped worldwide.